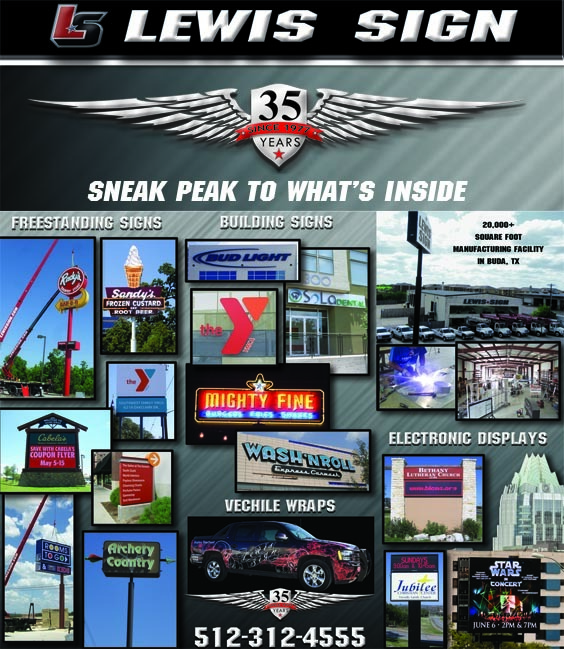 Established by Bill Lewis in 1977, Lewis Sign Builders provides a wide array of signage services. From Signs for poles and buildings...to custom banners...to lettering on your own front door. Lewis Sign Builders always makes you look your very best! And we do it on-time and on-budget by utilizing in-house manufacturing, machinery and lift equipment. Honesty, Quality and Integrity. Signs of good things to come! At Lewis Sign we want you to know one of our commitments to our customers is to not over promise and under produce. We have the largest and nicest installation fleet in Austin, Texas, and we know how important our job is to get your signs up on a timely basis. If we are installing a sign for a national sign company or for a local business owner, every job is equally important. Please call us today for an estimate to manufacture and install all your signage needs. At Lewis Sign our business is all about our customers, in fact our mission is "To provide our customers with the HIGHEST level of customer service that they have ever received & deliver a level of quality that EXCEEDS their expectations. To request an estimate or get help with a project, visit our Products and Services tab. To download useful software and find helpful information, search our Resources & Support tab. To learn more about us, browse through our Company Information section.